The most common type of bladder cancer is caused by the uncontrolled growth of the cells lining the bladder wall. If the cancer hasn't grown from the bladder lining into the muscle of the bladder it is called superficial or non-muscle invasive. Superficial bladder cancer can be treated by removing it from the bladder wall. The procedure is called transurethral resection of bladder tumour (TURBT). Q. What is the purpose ? The surgery is done to remove small, shallow tumors from the inside surface of the bladder for the treatment of non-invasive bladder cancer. It is also used to biopsy for larger or aggressive cancers. Q. How is it done ? The tumors can be removed through a probe passed up through a cystoscope. The tumors are then removed through the cystoscope and sent for microscopic exam. The results should be available in 5 to 7 working days. Your doctor will be discussing the results with you. 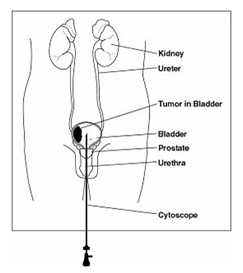 During surgery, a Foley catheter is placed in your bladder to drain the urine. After surgery, your urine may be bloody and there may be some clots in it. Continuous bladder irrigation (CBI) may be needed to clear your urine if you have a lot of clots. With CBI, a special Foley catheter is used to irrigate or flush the bladder continuously while your urine and the CBI fluid empty into a drainage bag. If you are not able to urinate on your own after the Foley catheter has been removed, you may need to go home with your catheter. Your urine may be bloody, but it should clear 2 - 4 days after you are home. Blood in your urine may last up to 4 - 6 weeks. You may have some irritation and burning with urination. Drink plenty of fluids, 10 - 12 (8-oz.) glasses per day. Take your pain medicine as prescribed, when needed. Avoid letting your bladder get too full as this would increase the pressure in your bladder and make you bleed more. Avoid straining and constipation; increased pressure can cause more bleeding. You can prevent constipation by drinking fluids and adding fruit and vegetables to your diet. Stool softeners or a mild laxative may be prescribed by your doctor. You can resume your normal activities in 3-4 weeks. Do not lift anything weighing more than 5 to 10 lbs. No strenuous activities (i.e. aerobics, jogging, swimming). Limit stair climbing to 1-2 times per day. Do not drive until OK with your doctor. You may slowly increase your activity, but rest when you get tired. You may resume sexual activity after the second week. You may drive if you are not taking prescription pain medicine and if it is OK with your doctor. You may return to work during the third week or when your doctor allows. TURBT is commonly performed and generally safe. However, in order to make an informed decision and give your consent, you need to be aware of the possible side-effects and the risk of complications of this procedure. These are the unwanted but mostly temporary effects of a successful procedure, for example feeling sick as a result of the general anaesthetic. This is when problems occur during or after the procedure. Most people are not affected. The possible complications of any operation include an unexpected reaction to the anaesthetic, infection, excessive bleeding or developing a blood clot, usually in a vein in the leg (deep vein thrombosis, DVT).